Okabu isn't meant to be an "issues" game. It isn't meant to teach you that we should care for our environment, that pollution could one day kill us. But it is, and it does. Fortunately it's also a charming, creative game that hides those lessons behind the oddly anthropomorphic heroes of Finnish artist Mikko Walamies' creation and the clever gameplay of developers Handcircus. Both worked on popular iPhone game Rolando. Handcircus founder Simon Oliver doesn't really want to talk about deeper meaning and themes of his studio's first big title when I sat down with him last week at the Game Developers Conference. It's there, we both know it's there, but I think he's a little worried that the notion of a game that can teach moral lessons could be off-putting, no matter how subtle. "We don't want to be too heavy-handed," he says. "We don't want to be an issues game, but we wanted to make a world people care about. When they see this would they want to clean it up." The world of Playstation Network game Okabu is driven by a tale of two cloud worlds, Oliver tells me. People in those worlds have become sick from the pollution rising from the earth." The living clouds of these worlds decide to go down to research what's going on. On earth they discover two tribes: The Doza and the Yorubo. The Yorubo are a nature-loving people, while the Doza have industrialized and are killing the planet. 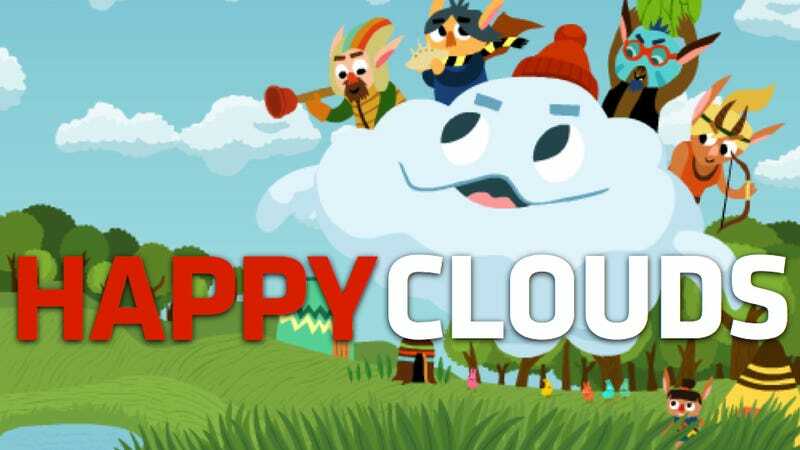 In the game you play as Cumulo and Nimbi, two clouds that can absorb water and later drop it in a downpour or squirt it out. But to beat the game you will need to team with four heroes of the Yorubo, cloud riders who each have different abilities. Whether played alone or with a buddy, players will control both clouds, allowing them to take two riders on any given level. I saw two heroes during my time with the game, one had a plunger he could attach to things and then, with the help of the cloud, drag those items around. The other had a pied-piper like ability to control animals. The enemies of the game are dozabots, mechanical creations, and the prevailing pollution that can impede the clouds' ability to absorb water. For instance, in one level I need to absorb water with a cloud, but the pond is fouled with litter. So I use a hero to grab up the litter and drag it to a large container marked with a not-so-subtle recycling logo. I use the controller to dip my cloud into the pond, turning it slightly blue, and then float over to plants to rain on them. The water causes the plants to grow, producing oxygen which then pushes back the smog that was preventing me from floating through an area of the level. I later use a plunger to grab some exploding fruit, dragging it to a gate to blow it out of the way. Dozabots can be destroyed with rain, or rampaging animals, like a bull. To charm an animal, players need to have the right hero riding a cloud, and then they hold in a button and use the cloud and its hero to paint a path for the creature to follow on the ground. Bulls can be charmed into charging into things, chicklets can be charmed to eat vegetation, like a wall of bushes blocking your path. The game will have four worlds to go along with its four heroes: a lake, a dried river canyon, a forest and a doza quarry. Due out this summer on the Playstation Network, Okabu is shaping up to be a fun diversion, a game that teaches without really making that the point. Sort of like a more subtle version of Happy Feet.